Your liver is the largest organ inside your body. It helps your body digest food, store energy, and remove poisons. You cannot live without a liver that works. If your liver fails, your doctor may put you on a waiting list for a liver transplant. 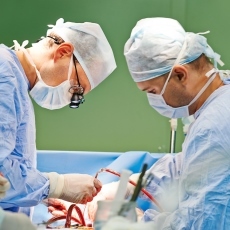 Doctors do liver transplants when other treatment cannot keep a damaged liver working. During a liver transplantation, the surgeon removes the diseased liver and replaces it with a healthy one. Most transplant livers come from a donor who has died. Sometimes there is a living donor. This is when a healthy person donates part of his or her liver for a specific patient. The most common reason for a transplant in adults is cirrhosis. This is scarring of the liver, caused by injury or long-term disease. The most common reason in children is biliary atresia, a disease of the bile ducts. If you have a transplant, you must take drugs the rest of your life to help keep your body from rejecting the new liver. Article: Role of Transplant in Biliary Disease. Article: Improving Access to Liver Transplantation through the ECHO Telehealth Model.